Is there hope for greater protection for refugees? 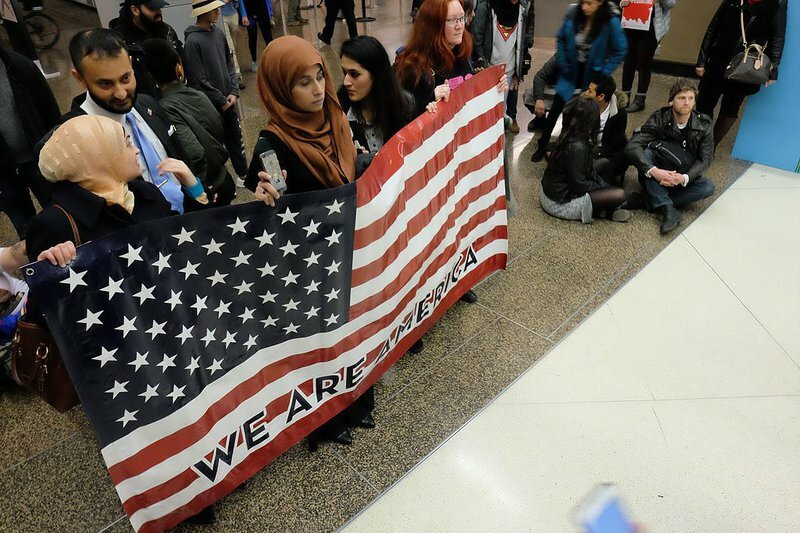 Support for refugees and immigrants was very visible at recent airport protests and on social media, but historically it has been a minority position in the United States. A Pew Center research report after the election argued that the US public “seldom has welcomed refugees,” pointing to polling data on Hungarians in the late 1950s, Indochinese in 1979, and Cubans in 1980. Opponents to the Trump administration’s travel ban hope to reverse or limit the effects through court orders or Congressional actions—they have temporarily succeeded in getting the ban suspended in court. Yet, if the rhetoric of the campaign is any indication, the overall direction of immigration policy is likely to remain restrictive under President Trump. The leading intergovernmental organizations, the International Organization for Migration and UNHCR, appear diplomatic but somewhat resigned. Humanitarian NGOs involved in both service delivery and domestic advocacy are more combative. Oxfam America condemned the executive order as xenophobic, and the International Rescue Committee called for an urgent rethink. An airport demonstration against Donald Trump's immigration ban. Support for refugees and immigrants was very visible at protests and on social media, but historically it has been a minority position in the United States. On the local level, towns such as Rutland, Vermont—which made national news this year due to the mayor’s controversial announcement that they would accept 100 new Syrian refugees—have had to readjust expectations. Rutland’s efforts came to a halt with the Trump administration’s executive order to block all refugees from Syria and several other countries. Only two families were able to arrive. Now that the ban is suspended, everyone is uncertain what will come next. While this abrupt turn is disappointing to many, policy instability is a constant in the issue of refugee resettlement. The Syrian civil war began in 2011, but the US government only accepted substantial numbers of Syrian refugees in the last year of the Obama administration. The larger issue for the United States and the international community is that, when it comes to international refugee law, host countries have the right to determine which and how many refugees they will accept. The two oceans that bookend the United States have long given this country unequaled insulation from migrant flows. The two oceans that bookend the United States have long given this country unequaled insulation from migrant flows. The concerns voiced by Trump about the security implications of refugees are not new, however, either here or abroad. While the volume and volatility of these flows are concerns for all states, the security implications are most severe in countries with weak or failing governments. European states have struggled to respond to the Mediterranean refugee crisis—more than a million migrants entered Europe by sea in 2015 alone. The situation is even worse among developing countries, which have been the main recipients of refugees since the 1980s. The responsibility of caring for refugees is not evenly distributed, and tends to fall on those states that have the fewest resources at their disposal. Humanitarian NGOs like MSF, CARE, and Oxfam try to fill these gaps, but the limits of host state policies leave these NGOs condemned to repeat the mistake of injecting resources into ongoing conflicts. Meanwhile, the UN and powerful member states prefer to repatriate refugees rather than resettle them. This international regime based on host country autonomy and repatriation allows many refugees to fall through the cracks. In response, some advocates have sought to shift attention from states to individuals. Refugee response is a subfield within the larger sector of global humanitarianism, and like all humanitarian crises today, has been marked by at least two competing views: an understanding of refugee flows as a security issue versus a human rights frame that emphasizes individual protection and rights. In a recent review of American asylum policy, Rebecca Hamlin documents a vigorous battle over the past seventy years between those legal institutions committed to international human rights standards and a largely conservative movement committed to state sovereignty and border control. These competing frames are starkly visible in my local newspaper and in our national debate. While Rutland Alderman William Notte feels “extreme disappointment,” others worry about the burden on a small town of providing for new migrants. The shrinking population of the town, and smaller tax base, raises tough questions about how local monies are spent, and locals are also concerned about the cultural differences that would accompany a new refugee population. The executive order calls for a review to ensure that refugee policy is in “alignment with national interest,” but the president of World Relief, the humanitarian NGO of the National Association of Evangelicals, worries that the new travel restrictions “further traumatize a group of people that have already borne so much tragedy.” The perennial tragedy of the international refugee regime is that the fate of these individuals lies in the hands of host states whose policies appear erratic within and across administrations. In the short term, American supporters of refugees will have to channel their aid to groups like these that work overseas with refugees. In the long term, the turmoil of last this weekend suggests there might be a political opportunity to address the disconnect between the public imagination and actual migrants and thus reshape attitudes on US migration policy.